I continued work on my mage this week. Profession quests and the order hall campaign. Not sure if I will have time to get the order hall up and running, but I have gotten to the nuke a world quest research, which is useful anyway. 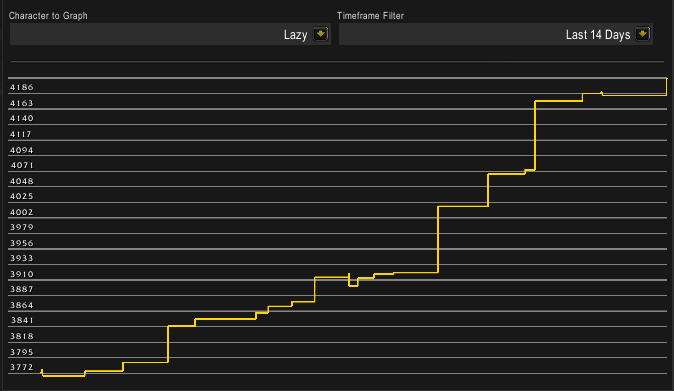 I mostly worked on profession quests on my mage this week. Overall we can see I made about 300k in sales, and I spent very little gold again.I have mostly stopped restocking BoEs which ahs meant a LARGE fall in my expenses. I will see if I can fill the gap with anything, but I don’t really expect to enter any high volume markets. It feels really good to hit a new high and pass 4 million liquid however. Considering spending some more time unlocking rare recipes when I can. I had some larger sales this week than the last one leading to some nicer mailboxes. I didn’t play much this weekend however as I had my 30th Birthday party on Saturday. 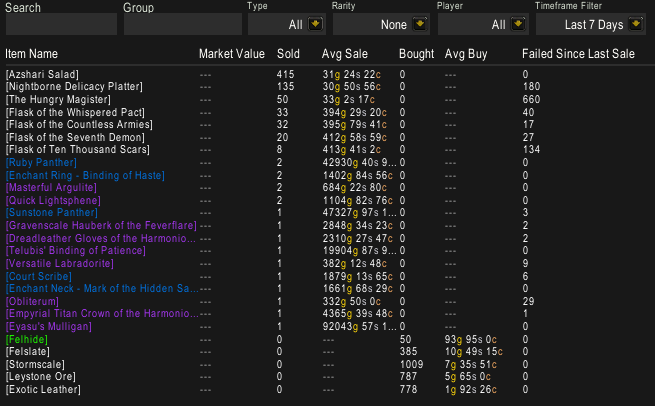 Once again I managed two 101 BoE sales in a week. It looks like my price decreases have started working decently. I also sold some crafted armor and 3 panthers! The panthers were definitely a nice addition. Two of them sold at the same time and if you get the right timing you can sell a full set to someone stocking up. On the volume side we can see that my food stocks are getting close to running out. I still sell a really nice amount of food however, so overall this is looking really good. 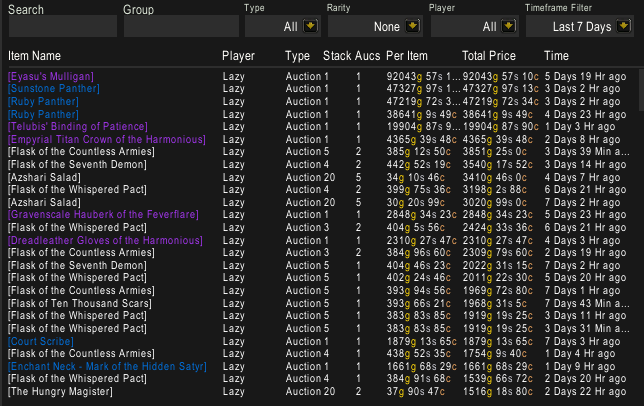 The Court Scribe I sold this week is sold by the Court of Farondis rep vendor for 500 gold, so that is a very nice little flip to sell for 1800. 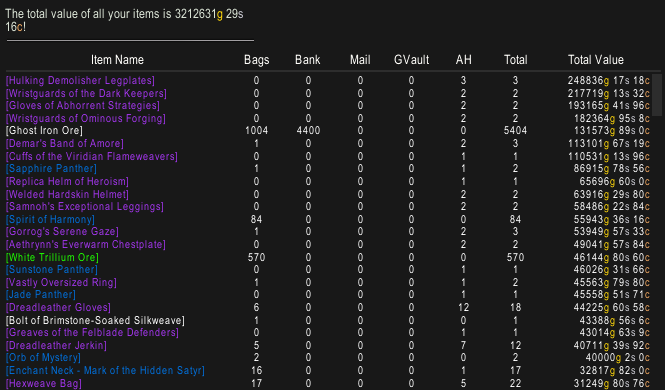 I also sold some crafted armor I recently restocked and flasks remain great sellers for me. I feel like there’s almost no point in even commenting on my inventory. I neither invested a large amount of gold, nor did I sell any meaningful BoEs so overall my inventory did not really change at all this week. 101s are falling on the value side as the market is definitely getting a lot less heated as we close in on the end. Great Stuff, Do you purchase your living steel, or do you use alchemists to keep up with it? I have 3 transmute mastery alchemists, in the process of leveling up a fourth, but occasionally I buy living steel when the price drops below 2k. I buy it on this realm. I prefer using the transmute for pyrium bars. How many transmute mastery alchemists would you say is enough? At least 1 if you have only a few characters on a given realm? As many as possible after covering all the other professions when there are a lot* of characters? * A lot in this case would be 10 of more. Depends how much you enjoy relogging. I have 5 on my main realm. Is that for 1 engineer and 1 jewelcrafter, or do you supply more of your own crafters with them? It’s mostly for one alchemist to produce Vial of the Sands. I only craft my own living steel if Spirits of Harmony is cheap.